Often, a vehicle has been purchased but not used. Perhaps a beloved great-aunt purchased a vehicle late in life only to lose her license shortly thereafter. Rather than take her car away from her, the best idea may be to leave it with her. Leaving it, however, has ramifications that could affect the new owner. It doesn't take long to see the cumulative effects of the elements on an unused vehicle. Frequently, the issues make themselves known in very visible ways. Cracks in the dashboard or faded, peeling seats indicate too much exposure to heat. Fading on the roof or hood of the vehicle lets you know the sun has beaten down on it day after day for an extended period. A car that has not been placed into proper storage may also experience "technical difficulties." At Vines Storage near Highland, CA, these and other problems may be avoided. Some of the adverse effects of leaving a car unmoved for too long may not be seen right away. For instance, tires that have driven very few miles can break down simply from exposure to the elements. Once the vehicle is back on the road, there is a chance that its brakes will not perform properly. Perhaps the damage from non-use will be most evident in the unlubricated engine parts that have been deprived of necessary fluids. These issues can be significant and they do not even take into account what can happen because of harsh temperatures, either hot or cold. Rather than take a chance with a vehicle that may not be used, the wise choice is to look at the best possible options for storage. In many cases, especially in Southern California, indoor storage makes the most sense. 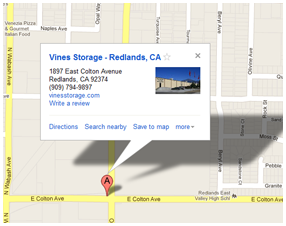 Vines Storage, conveniently located in Redlands, has spacious indoor and outdoor storage areas for vehicles of all sizes. Our secured facility houses classic cars, antiques, seasonally used vehicles, RVs and more. We know storage and we do it well. For information regarding our flexible leasing packages, stop by or call our office today.